(1) Advanced chemical reagents ,mainly Building Blocks. Hanhong Scientific has owned a lot of senior researchers, including doctors, professors and experts of organic chemistry for R&D and process control. The company has built R&D center in the Universities, and has established plant owning over 120 sets of various reactors from 10L-5000L. Relying on its R&D and producing facilities, Hanhong Scientific can manufacture custom-made products from grams to tons. 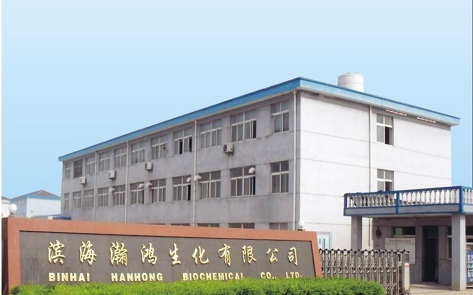 Binhai Hanhong Biochemical Co., LTD. is the total venture company of Shanghai Hanhong Scientific Co., Ltd., mainly produces pesticides, dyestuffs, pharmaceutical materials and their intermediates. It is located in Yancheng Coastal Chemical Zone, which is the famous chemical zone in China. It covers an area of 35,000m2 including four multifunction chemical plants, one pilot plant, one waste water treating plant and labs. The company has 80 employees. There are over 40 sets of reactors from 50L-8000L.It possesses such advanced analytic instruments as HPLC, GC, HPCE and etc. Hanhong includes Manufacturing Department, Technology Department, Quality Control Department, R & D Center, Market Department, Administration Department and other departments. The R&D Center owns labs with one of 300 m2 (in Shanghai) and another one of 1000m2(in Production Base). The labs are equipped with experimental apparatus for all developing scales. In addition, well-equipped QA and QC system guarantees products’quality for all scales R&D and production. In the R&D Center,there are 12 Chemists of organic synthesis in lab, 30 people for grams-kgs scale preparation, 5 analysts for QA/QC.